Halloween is a holiday filled with friends, costumes, scary stories and candy for humans. In the U.S., celebrating by masquerading in elaborate costumes through the neighborhood is a deeply entrenched tradition. More and more families want to include their pets in their celebration for Halloween (they are members of the family after all). However, Halloween isn’t the same for cats as it is for humans. It is widely believed that cats – especially black or white cats – are used by Satanists in horrific rituals around Halloween. This belief leads many animal rescue groups to ban adoptions on black cats (or all cats) for the period around Halloween. It is feared that these Satanic Cults will torture, mutilate, and sacrifice any cats they can get their hands on. Many believe that stray cats and other cats found outdoors are at a very high risk of being abducted by these groups. According to Snopes.com, a website that tests the validity of online rumors, there is no real evidence that Satanists use cats of any color in their rituals. They do not deny that cat killings occur, only that it does not appear that Satanic Cults are to blame and that the killings do not necessarily increase around Halloween. Cat killings and thievery are a year round problem and the real culprits may be increasing populations of predatory animals near cities (i.e. – coyotes), cars and disturbed teenagers. Cat Killer gets 8-year sentence – This 21-year old man adopted 3 cats and then killed an mutilated them in San Antonio, Texas. Judge Sentences three teens for Battleground shooting spree killing cats – In Vancouver, Washington 3 teens used a .22 caliber rifle to kill more than 50 animals. One cat was shot in the face while her owner looked on. Scott Andrew Graham, accused of mutilating and killing cats, to be arraigned in Mesa court – This man in Mason, Arizona admits to stealing more that 40 cats, but claims he just “loved” them and set them free. The video with this story says it all. Keep your kitty indoors. Even if your cat happens to be an outdoor cat, this would be a good night to bring them in. There is likely to be higher traffic on Halloween night which increases the chances of being hit by a car. Even people driving slowly might be distracted by all the children in costumes and not see your cat crossing the road. Also, you never know when someone with bad intentions will cloak themselves with the anonymity that comes with a larger-than-normal crowd to pull off their schemes. Candy is for humans only. If you want to give your kitty a treat, make sure it is something that is made for cats to eat. Chocolate is toxic to cats and can cause seizures or worse. For this reason, it is also a good idea to keep candy baskets out of your cat’s reach. Don’t let cats eat the decorations. 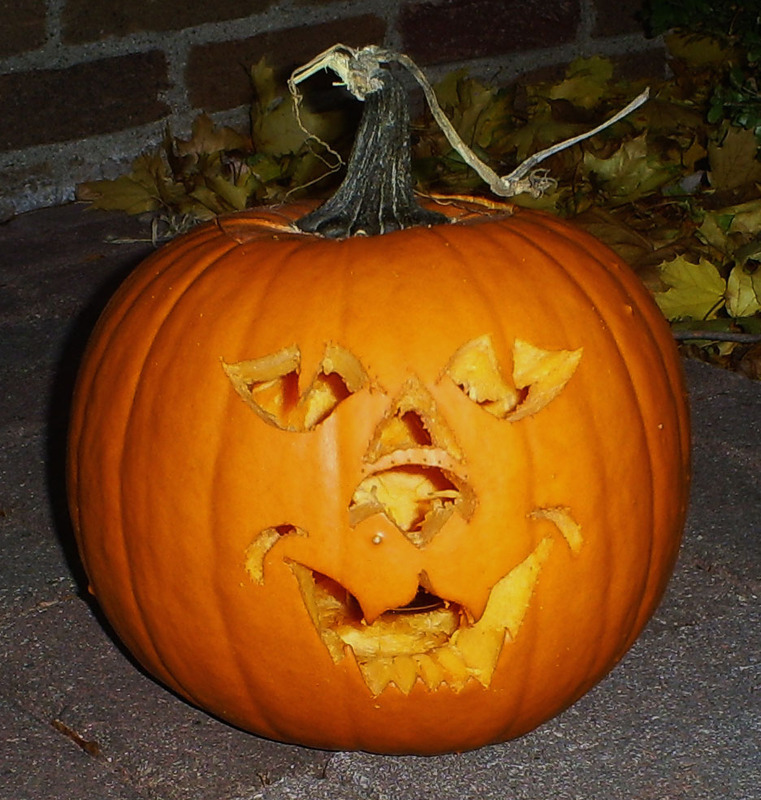 A jack-o-lantern that has been sitting for a few days can build up bacteria inside. That bacteria cause gastrointestinal troubles for your cat if ingested. Corn decorations can be a problem for your cat’s stomach too. Hide the electrical cords. Cats that chew electrical cords will be in for a real shock. Keep costumes consensual and safe. 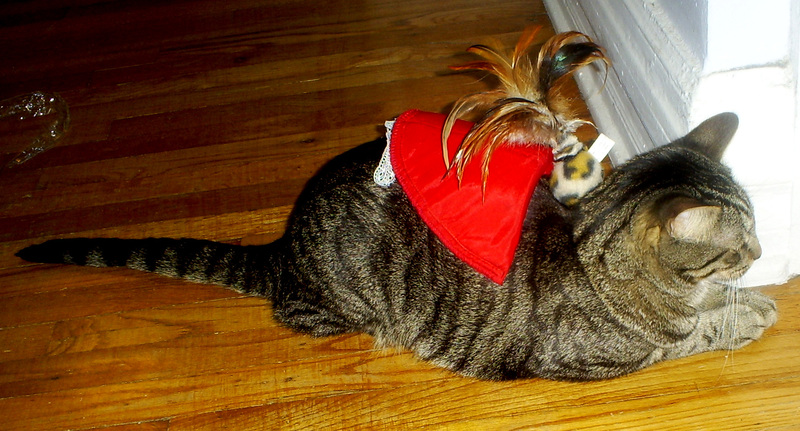 As much as you would like your cat to wear a costume, if the cat wants nothing to do with it, don’t make him wear it. If you force a cat to wear something that they don’t want to wear it may cause undue anxiety. Should your cat agree to wear the costume, make sure it fits properly and doesn’t have any dangling parts that the cat could swallow or choke on. Keep candles away from your cats. Sometimes cats get curious about fire and will venture close enough to light themselves on fire. Flaming kitties aren’t much fun. Give your cats their privacy. Many cats won’t like all of the strange noises and unfamiliar people coming to the door. Even cats that are normally social may become anxious once your doorbell starts ringing non-stop. It is a good idea to put the cat in a room and close the door so that they can feel secure. Calming products are available to help with excessive anxiety. Make sure your cats have their ID. If there is any chance that the cat could get outside, you will want to make sure they are wearing an ID tag on their collar. This will help you get your cat back if it wanders off. What Are the Dreams of Cats About? Hi Robin. It’s great to read this as every year since my children were quite young they would be absolutely adament that we keep our cats (and especially our black cats) in safe and sound on Halloween night (they are in at night anyway). They always heard these rumours of awful things happening to black cats at this time of year. We are extra cautious anyway and thanks for the great info! Hi Robin, I’ve linked this post to mine today so that my readers can drop by to read this 🙂 Happy Halloween! Thanks Sherri! I hope it helps keep a few kitties safe 🙂 Happy Halloween to you as well!